Same here, my sparrows seem to have had a good year also. Been plenty of young ones. Not noticed them still taking food though. Speugs are just about the only fevvered visitors I'm getting lately - had about 20 today. They're getting rich pickings all to themselves ...... apart from 1 juvenile robin, 3 blackbirds and 1 dunnock. Same here Placi. I can add a few members of the pigeon family to your list but not much more. It has something of Pam Ayres style about it. Spot on - Pam Ayres to a 'T'. 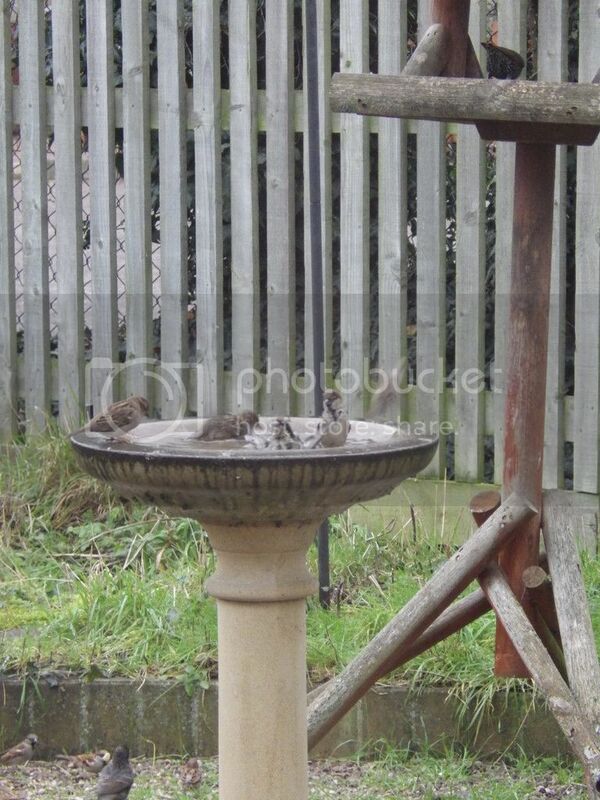 I had just got rid of the ice on the bird bath and this lot arrived. Sparrows are all I have just now,and lots of them. What has become very obvious over the past week is that my Sparrow population has decreased by at least half. This is the first time I've noticed a sudden drop in numbers and I have wondered why. My theory is that as we are now approaching the nesting season they have split up to regain their territory where they usually nest. I hope I am correct as I would be mortified if they has come to any harm.